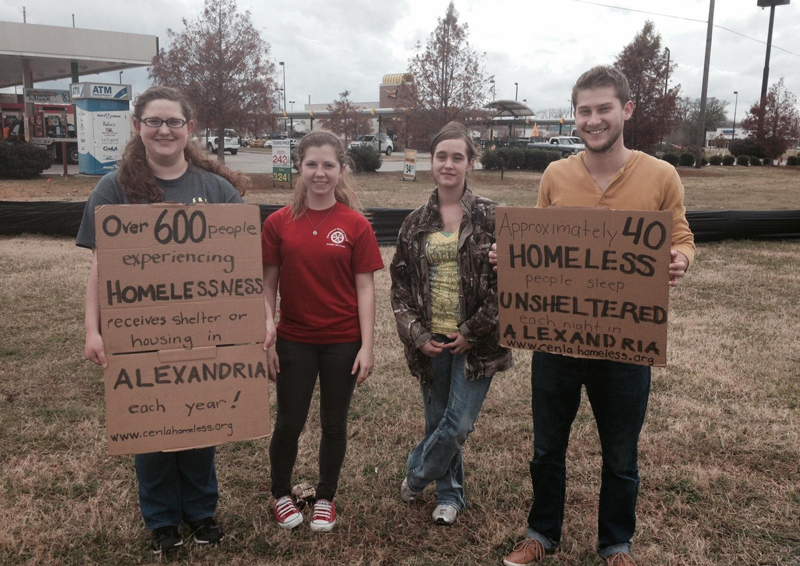 How Can You Volunteer to Help the Homeless? We couldn't do what we do without our team of dedicated volunteers who are always ready to go above and beyond! Volunteers help us reach beyond our limits as service providers by bridging the gap of services and resources. Volunteers can help out with things such as the homeless street count, advocacy events, fundraisers, office work, building maintenance, helping homeless clients move into their new apartments, and outreach activities that provide food, clothing, blankets, and other necessities. Be sure to let us know about your outreach activity! Outreach activities are our most popular form of volunteering. Our staff and volunteers walk the streets of central Louisiana, going under bridges, in abandoned buildings, over levees, etc. to find the homeless where they are and provide them with basic essentials and refer them to community resources. As always, safety is of upmost concern, so our volunteers never go out alone and are instructed on important precautions. If you have any questions about outreach, before you sign up, please e-mail Kyle at KyleM@cenlahomeless.org. If you are intersted in volunteering, please Join Us and select which activiites you're interested in volunteering for! Scheduled volunteer opportunities are listed to the right and provide links to register! [Volunteering for the homeless count] is an outstanding opportunity for me to learn & better understand all about my neighbors of my own community and how they are minimally living and often suffering daily. It is truly an eye-opening event that makes me humble and much more appreciative of my life. I am very proud that I am contributing in my own small way by participating with many other like-minded community members in this important count. 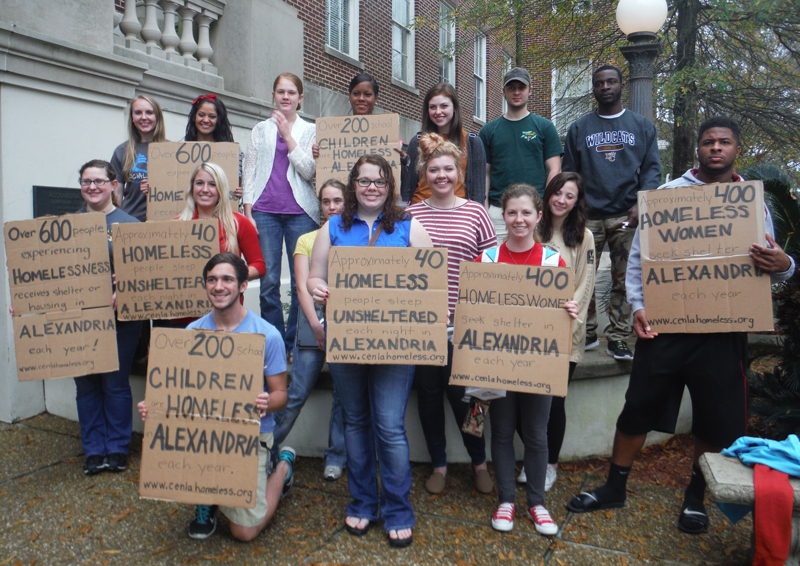 Working with the Homeless Coalition for the street count was an incredible experience. The project opened my eyes to the homelessness that exists in my own backyard. Not only was I able to learn about the homeless community in Central Louisiana, but I was also able to be a part of the change that the Homeless Coalition desires to make. 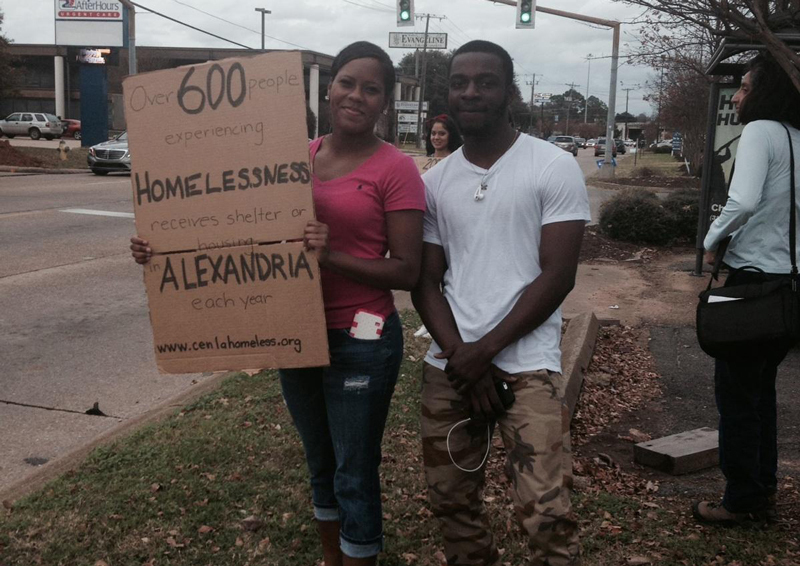 Most people are not aware of homelessness in Central Louisiana. 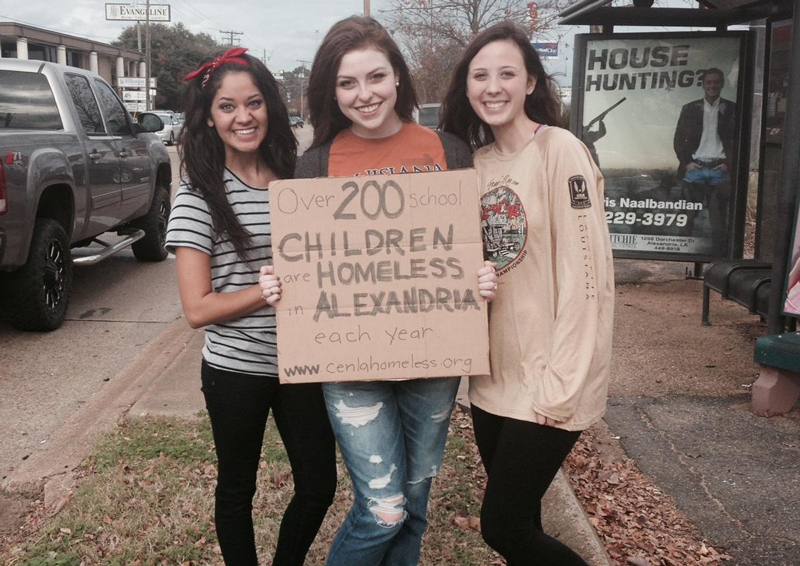 Learning there are more than 200 homeless children alone in the Rapides Parish school system really surprised me. 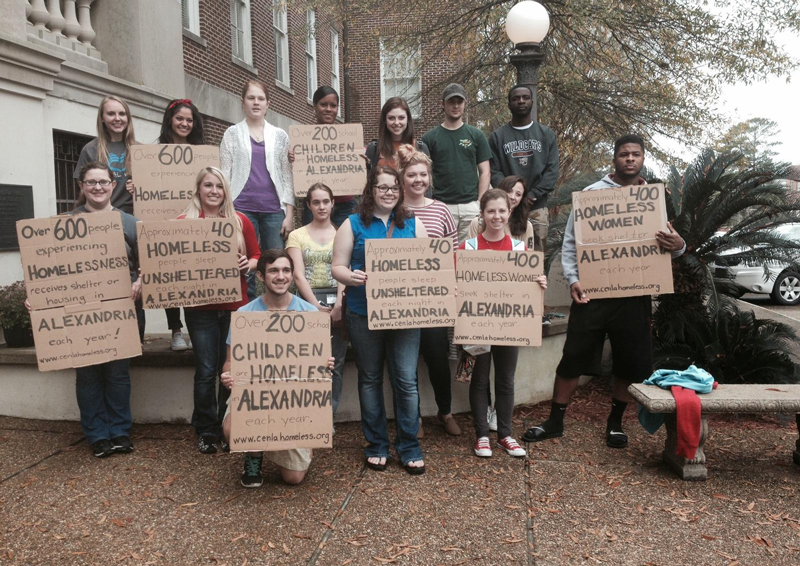 This is one of the reasons I wanted to help spread the word about homelessness through the Homeless Coalition and Louisiana College Social Work Club Awareness Campaign on December 5th, 2014. Volunteering through the Homeless Coalition has made me aware of how important a community effort is in ending social problems. It's exciting to see individual members of the community as well as businesses and organizations working together to solve the issue of homelessness in Cenla. Participating in the street count for the Homeless Coalition changed my view on how hard the coalition works to end homelessness. 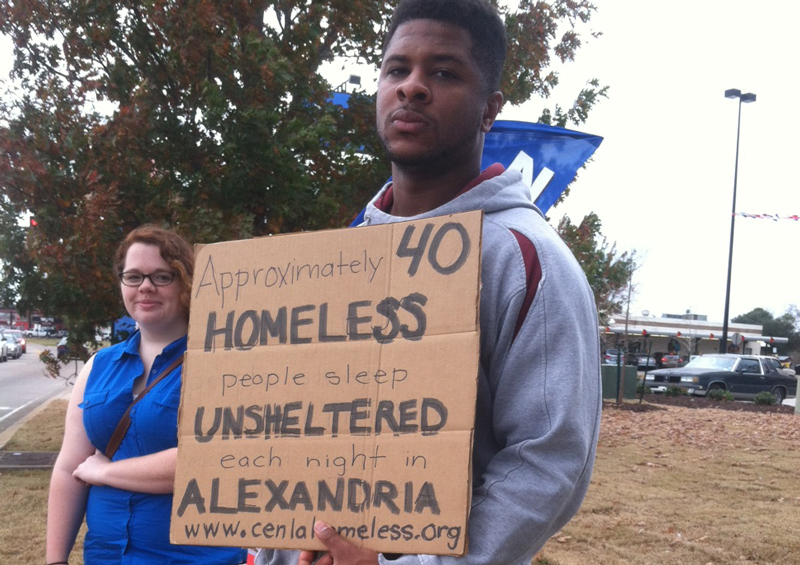 The street count also showed me the reality of homelessness and the poor living conditions of those who are homeless. I was glad to be able to see firsthand the passion that the Homeless Coalition has for this community and I hope to work with them in the future. 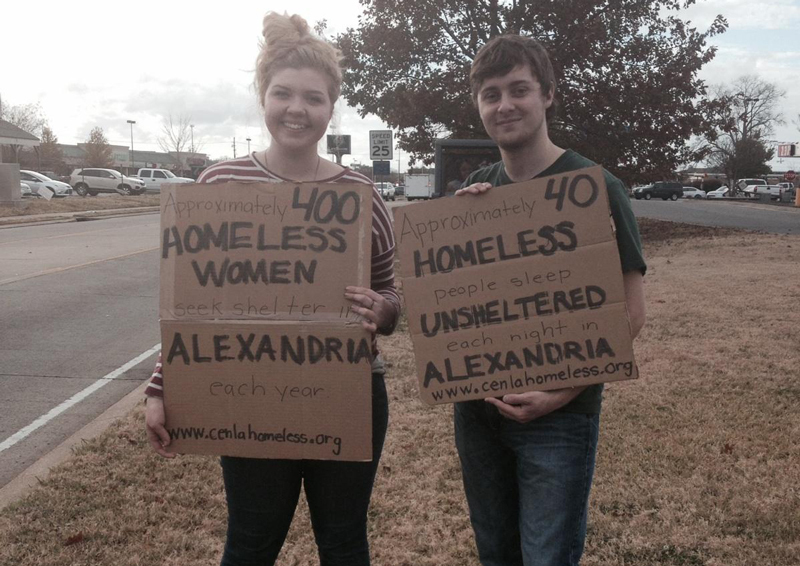 Being involved in the homelessness awareness campaign opened my eyes to the reality of homelessness in our community. It was amazing to see people in our community respond and want to know how they can help. It shows that the more people are aware of this problem, the more involved our community will be. With the extroardinary help from our Cenla community, our unsheltered homeless population now have a place to shower, wash their clothes, get their mail, use the phone, and much more! Your dollar continues to make a difference for these people. Each dollar you donate to the Central Louisiana Homeless Coalition helps to maintain our Homeless Resource Center for people experiencing homelessness. Your donation will help keep the building up and running, including paying the water and electricity bills, cleaning supplies, and other essentials. In-Kind donations are just as important as monetary donations! Our homeless rely on the generosity of others to help them get by with essential items (soap, shampoo, toothbrushes, toothpaste, deodorant, lotion, razors, bug spray, hand warmers, blankets, etc.)! CLHC also tries to provide the homeless with nonparishable snack items (beef jerky, canned meats, peanut butter, crackers, fruit snacks, hydrating drinks, etc.). Moving somewhere can be stressful! Especially when you're moving from the streets, with nothing to your name, to an apartment. When CLHC helps a homeless person/family move into permanent supportive housing, we hope to have them a house warming basket with household essentials, to help them get started. House warming baskets can include laundry baskets, trash cans, small set of pots/pans, plates, bowls, forks, knives, spoons, kitchen utensils (can opener, pizza cutter, sponges, etc.) kitchen towels, toilet tissue, cleaning products, etc. As a sponsor of the Central Louisiana Homeless Coalition, you are supporting the idea that every individual has a right to safe, decent, and affordable housing. The Central Louisiana Homeless Coalition annually identifies and assesses a number of people who are deemed chronically homeless to determine the acuity and medical vulnerability of each person. Then, together with our member agencies, we attempt to permanently house these individuals, beginning with the most acute and most vulnerable persons. Sponsorship dollars support the coordination efforts led by the Coalition to identify and assess each individual. Without your sponsorship, there would be no one coordinating this effort to house our most vulnerable homeless individuals across all homelessness programs. In 2013, the Central Louisiana Homeless Coalition began tracking the number of chronically homeless persons placed into permanent housing units. By December of that year, our Coalition had collectively housed 38 chronically homeless persons! Then, in 2014, our Coalition was able to permanently house 63 chronically homeless individuals, with most of them being homeless veterans! Your sponsorship ensures that the most medically vulnerable and chronically homeless individuals receive the top priority when a housing unit becomes available. "The services provided by the CLHC are critical not only to the homeless consumer but to Central Louisiana. We support their services because stable housing increases educational attainment, civic participation, improves health, as well as, decreases crime, creating a stronger community." "CHRISTUS Health Louisiana Ministries and CHRISTUS St. Frances Cabrini Hospital believe so much in the mission of the Central Louisiana Coalition to Prevent Homelessness that we have contributed $10,000 toward the purchase of a building for its Housing Resource Center." 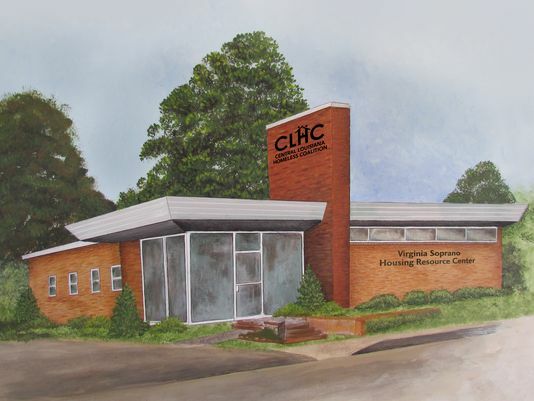 "I am excited that the CLHC is getting a new building for its Housing Resource Center, which will enable us to do the same that Pope Francis is doing in Rome. The center will also provide a one-stop where the homeless can receive referrals to other services offered in Rapides Parish."